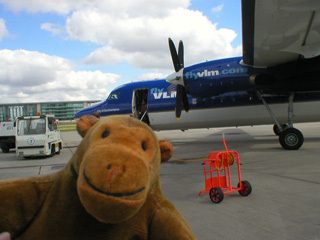 "I've never taken off from here before, you know"
Mr Monkey had wanted to take the Eurostar to Brussels, but when he'd converted the price into bananas he'd realised it'd be a lot cheaper to fly. So he took the tube and the link bus from Canning Town to London City Airport, and picked up his tickets for a VLM flight to Brussels when he got there. After a few minutes waiting and watching planes landing and taking off, his flight was called and he scampered aboard the Fokker 50. 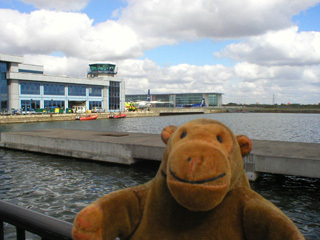 You can read about the airport at the London City Airport website and about the airline at the VLM website.